If anyone thought that Invictus was as dramatic as rugby could be, they should have checked out the Division II state championships June 5 at Alexandria's T.C. Williams High School. With the score knotted at 19 in overtime, Menchville's hopes for the top title in the Old Dominion - in just the school squad's second year in existence - had come down to the right leg of Graham King. Of course, the Monarchs had ridden said leg, and many others, to a perfect Peninsula District season. But now King wasn't running; at the Williams football field, he had to blast a rugby fall (imagine an overinflated football) through the uprights from about 20 yards away to cinch a Virginia championship. Graham leaned over to set the ball up on a tee, probably taking a bit longer than he needed. The SAT test he'd taken that morning had been nothing compared to this. No one was even cheering, and that didn't help much either. "The silence made it worse," said King, not one of the team's most prevalent kickers. "I do horribly under pressure when it comes to kicks." Last year, a new sport came about in the land of Hampton's Monarchy. Though it's never really caught on in America, rugby has been a popular sport throughout Europe and Africa for decades. It's arguably the epitome of a "tough guy" sport, full-blown contact with no protection, no breaks, maximum overdrive from whistle to whistle. 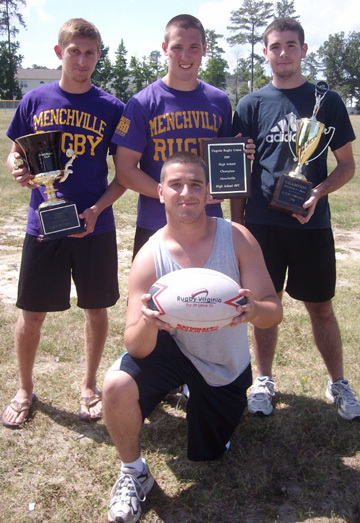 "The way that it's played is so different from other sports," says recent Menchville grad Antuan Byalik. "It's like the continuous flow of soccer, mixed with the tackling and the hard-hitting about football. Rugby just continues: OK, you got tackled, now get back up." In just its first year, Menchville's squad charged to the top of local competition, making it all the way to the state championship game... where they were drubbed 28-0 by T.C. Williams. Undaunted, the Monarchs came back for a 4-0 season this past spring, but got a wakeup call in the first round of the district playoffs, barely managing to eke out a 17-15 win over Denbigh. On high alert, they went into May 15's final ready to haul, and charged past Bethel 28-15. Still, it would be three weeks before they'd get a shot at the state title game, and didn't know yet who'd they be facing. "We took the first week off," says Gus Altschuler. "They we started having regular practices and scrimmaged in the second week. It was just like a regular game." On June's first Saturday, the squad headed across the state to Alexandria, but wouldn't get another shot at Williams; Louden County was the titlist of the other side. "We tried not to get too intimidated," King says. "Last year, we'd lost horribly, so we just wanted to prove ourselves. We had a lot to prove for our region, and for us." Loudon kicked for a 3-0 lead early on, but Menchville came right back down the field, and Colin McKee, one of Menchville's top soccer players, tied things right back up. The Monarchs kept threatening, but Louden scored a tri (equivalent to a touchdown in football, except worth five points), and kicked the conversion to take a 10-3 lead at halftime. At the break, remembers Steven Convery, "We talked about how they weren't a better team than us, and we could definitely get the ball in." But things didn't go particular well for either team throughout the second period (rugby's played in 35-minute halves), with no one scoring for over half an hour. "We kept getting within five meters," says Byalik, "and then there would be a penalty or we'd lose possession, and we'd have to go back down the field." But with only a little time left, the teams collided near midfield, and Menchville's Chris Blackwell yanked away the ball and charged about 30 yards to Loudon's 20. Time was past regulation at this point, but in rugby, the clock can't stop until the team with possession either loses the ball or has a penalty called against it. If a Loudon player grabbed the ball, or if the Monarchs did anything wrong, Loudon would take home the title. Graham grabbed the ball and made it to about the five. Loudon was called for a penalty, and Menchville's Nick Quinn snatched up the ball, quick-tapped it into his hands (gently deflecting it with his foot), and bolted through the Loudon defense to tie the score. McKey kicked the extra conversion, and things were tied at 10. "We were all pretty excited," says Steven Convery. "We didn't think score at the last second. We were trying to calm down and get ready for overtime." Just as with soccer's World Cup, things come down to penalty kicks in overtime. But this time, there's no goalkeeper to knock away the shots; it's like kicking field goals (from about 20 yards away) in football, except that there's no linebackers charging in to block the kicks. Loudon kicked first and made it, but McKey tied things back up, and Loudon missed its second kick. Blackwell, also experienced at soccer, knocked it through, giving Menchville its first lead of the game, 16-13. Loudon tied the score, but Altschuler got the Monarchs ahead again. After Loudon's fourth kick made the game 19-19, Convery went for Menchville's own fourth shot, and things didn't work out. "I hadn't kicked before," he says. "I swung at it, and it went far left. I missed it completely. It was terrible, but my teammates told me not to worry about it." With one kick to do, Loudon's final kicker went to the line, and blasted the ball toward the uprights. It was straight as an arrow, and Loudon's players started to celebrate. Then the ball bounced off the middle upright, and ricocheted back out of play. The Monarch had one shot to take the title. King finally finished positioning the ball, and stepped back to blast it. There was never any doubt. The ball sailed straight on through, and Menchville had a 22-19 victory. King was mobbed by his teammates and carried off the field. "I was amazed," he says. "Everyone dogpiled on me. It was like being in a movie. It was unimaginable, like a dream come true."